You can learn to make beautiful projects with basic quilling instructions. This paper craft is not only simple, but it can be transported easily for on-the-go crafting. Quilling is the process of rolling, bending, and manipulating paper strips into a variety of intricate designs. It was referred to as "paper filigree" in Europe, where this craft was recorded as early as the 13th century. It was a way for nuns and monks of poorer churches to decorate Bibles and other religious items without spending much money. When the craft traveled to the American colonies it began to be called "quilling." Although it fell out of favor for many years, it has been rediscovered by a new generation of crafters. With a few basic tools and some easy quilling instructions, you can master this easy, beautiful craft. Quilling is quite simple, but it does take a little practice to manipulate the shapes. Take your time, and be patient. Eventually, you will be making beautiful items in no time. Once you have the supplies you are ready to quill. Tear the quilling paper in half. Thread one end into the slot of the quilling tool. The end of the paper should barely be sticking out the other side. Hold the tool in your dominant hand, and hold the paper gently in your other hand. Begin to turn the quilling tool slowly so that the paper wraps around it tightly. Keep the paper edges even. When you get to the end of the paper, hold it in place for a few seconds. This helps to set the coil. Turn the tool over, and let the coil drop off the tip. It will loosen and uncoil a little; this is normal. Once it has finished loosening on its own, dab a dot of glue to the end of the paper and glue it to secure the coil. You have finished one basic coil. Of course, you will want to make different shapes for your crafts. Once you have the hang of making basic coils, you can make a variety of other shapes. The teardrop is a very useful shape. You can use it for flower petals, designs, and to create other advanced shapes. To make a teardrop, you start with a finished basic coil. Pick up your basic coil, and pinch it together to form a point at one end. Work gently until one end is pointed and the other is rounded in the shape you want. To create a marquise shape, make a loose coil and use glue to secure it. Then pinch it gently on each end to form a marquise shape. You can create a square by starting with a marquise shape. After creating the marquise, turn it 90 degrees, and pinch the ends again to make the square. It's easy to create a half circle shape, which can add dimension to your projects. To get started, roll a basic loose coil and secure it. Then simply flatten the bottom of the coil to create a half circle. A heart is easy to make; it is basically two coils. To begin, simply fold a strip of paper in half. Unfold it, and then place the end into the quilling tool. Roll the paper until it meets the folded area of the paper, and then remove the paper from the quilling tool and repeat this process with the other side. Dab some glue between the two coils to hold the heart in place. An S scroll is a useful shape, and it's very easy to make. You can create this shape by rolling each end of the quilling paper strip toward the center. Do one end at a time, and when you're finished, you should have an "S" shape. Secure the coils with glue. With these basic quilling instructions, you can make a variety of crafts and decorations for homemade cards, scrapbooks, and even pictures to hang on the wall. 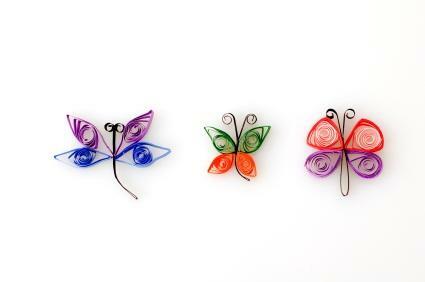 You also may want to view this slideshow of paper quilling ideas.